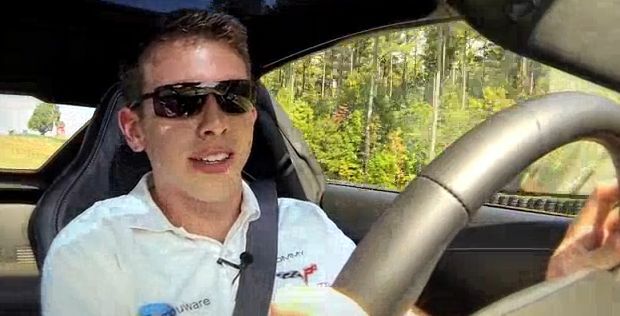 There’s probably a large list of perks that go along with Corvette Racing driver Tommy Milner’s job, but being able to pilot the 2014 Corvette Stingray around Virginia International Raceway has to be one of the best. The 27-year-old pilots the #4 C6.R race car in the American Le Mans Series alongside teammate Oliver Gavin. In this video we see Milner flinging the C7 Corvette around Virginia International Raceway, making it look fabulously easy. Milner gives us a play by play account of every dip, turn and straightaway of the track, as well as some informative feedback on how the car reacts, all while effortlessly holding race speeds. It seems fitting that Milner and the Corvette Racing team are out putting the new C7 Corvette through its paces, as the team will adopt the new C7.R race car for the 2014 Tudor United Sports Car Championship season. Scroll down for the video, and don’t miss Tommy and the rest of Corvette Racing for the final race of the 2013 ALMS season: The 12-hour Petit Le Mans on Saturday October 19th at Road Atlanta.